So sad to see these blind reviews come to an end, we are down to our final Blind cigar. Again, just in case you have been in a dark cave or under a pile of Christmas presents the last month. I am doing a run through of a 5 cigar blind set that Brooks from Smoking Stogie sent my way. Check out his site, now, I demand it. Enough asking nicely. He’s got some of the most honest reviews and best photography of some of the rarest sticks I have ever seen. 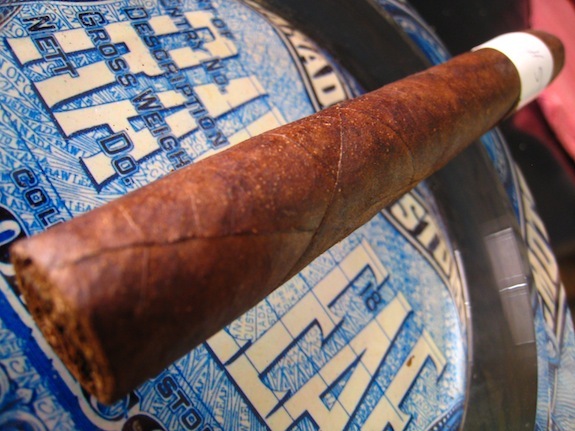 Prelight: Cigar #5 is a nice, hefty, large corona. 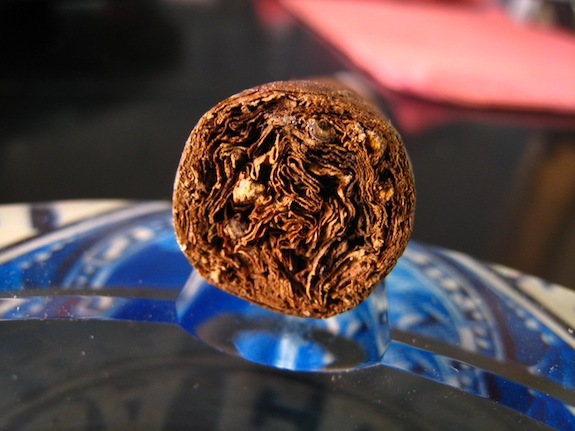 The wrapper is very, very dark sporting a very consistent dark brown color that only darkens to an almost black around the rounded cap of the cigar. 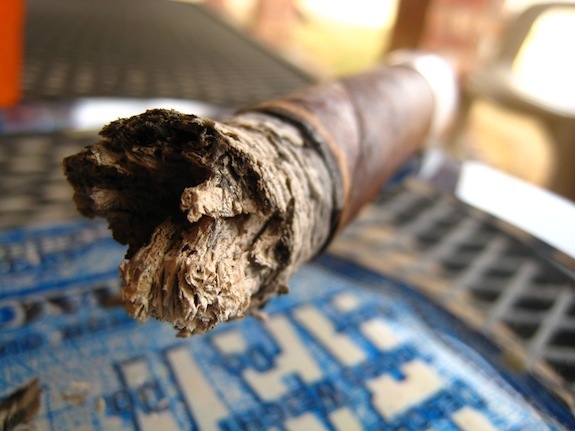 The only lighter brown spots seem to follow the path of the larger vein running through the body of the cigar. 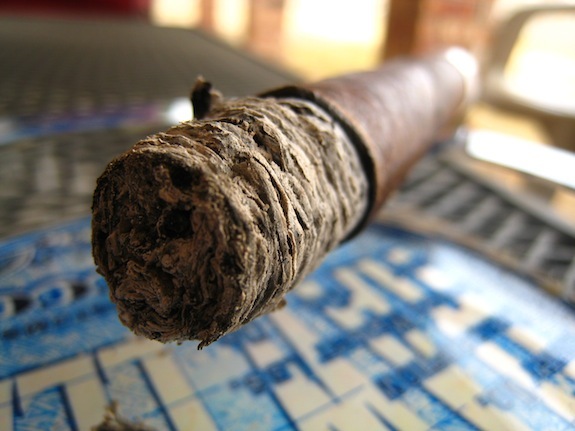 The cigar is hard as a rock and super firm to the touch. Hopefully this doesn’t result in a tight draw, but for the most part I am on a hot streak when it comes to good draws, so hopefully that pattern keeps. There are no soft spots at all. Even the foot of the cigar is hard and firm. There are a few larger veins running the length of the body, but nothing too concerning. They just help emphasize the beautifully, oily, well constructed cigar that this is. I am pulling a lot of spice and even some fruity aromas from the wrapper of this cigar while the foot is a spicy, sweet fruit as well. What a unique scent, hopefully this transitions into the smoking experience. The clipping was cake using my Palio double bladed cutter. The cold draw releases a very doughy, bready type flavor with just a touch of spice on the tail end. It almost tastes like a compacted ball of wheat bread. First Smoke: I am initially welcomed with a very nice, heavy white pepper flavor that filled my entire mouth, and left it tingling. The strong pepper stayed very powerful through almost the entire first third of the cigar. Once the pepper began to subdue a bit, hints of cedar, plum, spice, and coffee became evident. The pepper really demanded all the attention in the first third though. 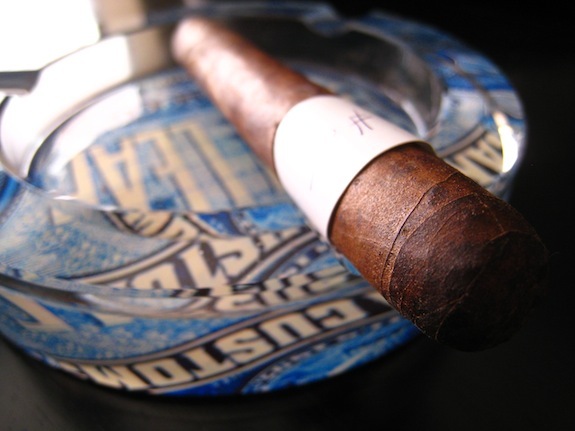 The cigar kicks out a very thick cloud of smoke with each and every draw requiring very little effort. I was a bit skeptical since the cigar was so firm, and rolled so tightly. 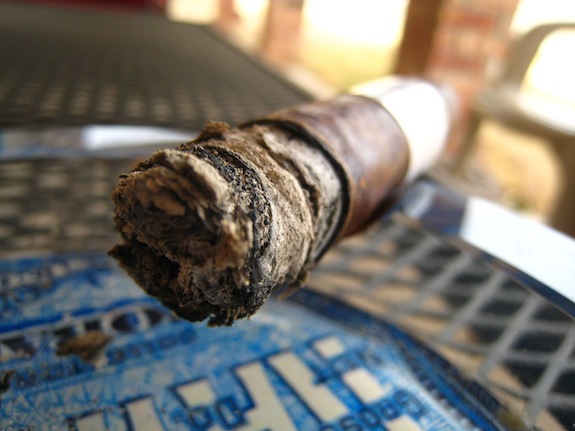 The burnline was a bit thick produces small waves early into the cigar. 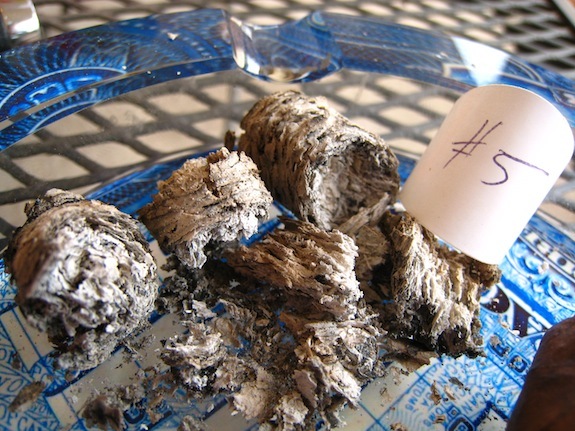 The ash is a beautifully compacted, bright white/light grey mixture and held steady for about an inch and a half before giving way. Halfway there: The fruit flavors are gone. The sweetness is gone. The Pepper is still rocking hard. And the body is in full effect. What is left is a strong, peppery, leather and woodsy flavor. This is definitely a man’s cigar. I am already feeling a little nicotine kick early into the second third. The burn has corrected itself completely, but constantly creates smaller waves before yet again correcting them. The ash keep flowering up on me, but astonishingly enough the ash has isn’t falling all over the place. The retrohale is killer. This isn’t a cigar I’d retrohale often as the pepper just kicks the crap out of my nasal passage. It definitely cleared my sinuses though. Finish: Into the final third now and the pepper is still holding strong. I almost with it would fade out a bit more and let the cigars other flavors shine through. Other than the pepper I am still picking up the leather and a woodsy flavor as well as little chocolate notes here and there. The burn has been all over the place, but lucky enough I haven’t had to touch it up, or relight. I am really feeling the body in this cigar, and have been since the very first draw. 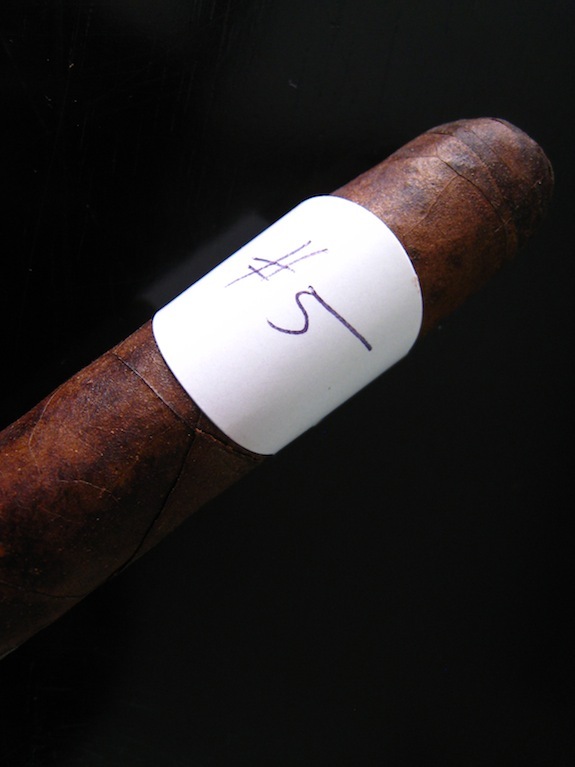 Again, I may not be the best judge in the strength of a cigar as even that is pretty subjective, but this cigar is definitely giving me a run for my money. Overview: Like I said before, this is a man’s smoke. This isn’t something you’d want to smoke early in the morning, and you really want to make sure you had some sort of meal before tackling it. The pepper stuck around quite a bit longer that I expected, or really wanted it to for that matter. I don’t mind peppery cigars but when it starts to overpower the other flavors in the mix it becomes a bit bothersome and really takes a toll on my pallet. This is something I would smoke again, but not often. Just when I am in the mood for an asskicking. This coming from someone who usually favors stronger cigars. Final Guess: I really wanted to say this was Pepin made, possibly Tatuaje, but the pepper was just a little too much. Not to mention I’ve guessed Tatuaje twice already and have been wrong. This could possibly be something La Flor Dominicana or it even reminds me of the Joya De Nicaragua Antano Dark Corojo . Either way, whatever it is, I am almost positive it’s got tons if not completely full of Nicaraguan tobacco. The Reveal: La Flor Dominicana Coronado Maduro. Was I actually right?!? WOW! Brooks goes on to tell me how there was only 83 boxes of these ever released. You can catch the first review he did of this cigar here: http://tinyurl.com/2eupjuv and a Redux review after a year here: http://tinyurl.com/2b3muou . He told me the first review was nothing but a pepper bomb, and it was tough to pull out the real flavors of the cigar. The second review was after a year a rest (I still think it’s a pepper bomb!). Well, there you have it. 5 amazing cigars sent over from an amazing BOTL. Brooks, that you so much again bro! I wouldn’t have let any of these sticks go! Thanks again for another fun blind taster. Very impressive! But, I have to admit, I was a little sad that it was number 5 of 5. Maybe Brooks feels the same and will set you up with some more in the future. As usual, keep up the great work! Happy New Year to all B (&S) OTL! Thank you Jake 🙂 hopefully we will have more early into this year. We really want to get the reader blinds going! Hope you had a good and safe one. Here’s to a great year!